Magnificient Havelis having attractive frescos and paintings require substantial investments from private enterpreneurs. The painted havelis of the Shekhawati region are akin to an open-air-museum of frescos. However, the region itself has become popular on the tourism circuit, with accommodation is heritage hotels and a great deal of interest in their preservation. Shekhawati region, particularly Jhunjhunu, Nawalgarh, Lachmangarh, Mukundgarh, Dundlod, fatehpur, Ramgarh and Mandawa. Though substantial private investment is required to halt their decay, these havelied are ideal for re-use as hotels, galleries, museums, restaurants, shopping establishment or even as institutional buildings. Popular liquors of Rajasthan such as Kesar Kastoori, Asha, Jagmohan can be branded and marketed through private investments. Rajasthan has a tradition of fine liquors such as Asha, as well as robust sprit's such as Kesar Kastori and Jagmohan. Anywhere in the state. 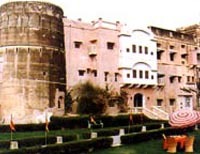 However, in the shekhawati region, this could include traditional centres such as Mahansar, Mandawa, Nawalgarh, Udaipurwati, Pali, Udaipur-especially with tourists. Marketing such branded products has not happened top date, but could prove popular - especially with tourists. This industry offers scope for private investment for its greater popularity. Not many know that India's ittar tradition owes a lot to the rose fields of Ajmer. Ajmer; also other agricultural areas suitable for horticulture. These include Pushker (Ajmer), Khamnor (Haldighati) and jaipur as modern centre for scents. This is an untapped field in private investment.